The rush to adopt machine learning practices has become ubiquitous in every industry. Enterprise data scientists want their AI models to be deployed into production to propel their organizations forward. Meanwhile, IT is looking for ways to enable their data scientists to build, train, and deploy their models in a way that does not compromise the security of their organizations, while making efficient use of resources like costly GPU clusters. Anaconda, the creator of Conda, has adopted Kubernetes as the standard for building and deploying ML models at speed and scale in Anaconda Enterprise. 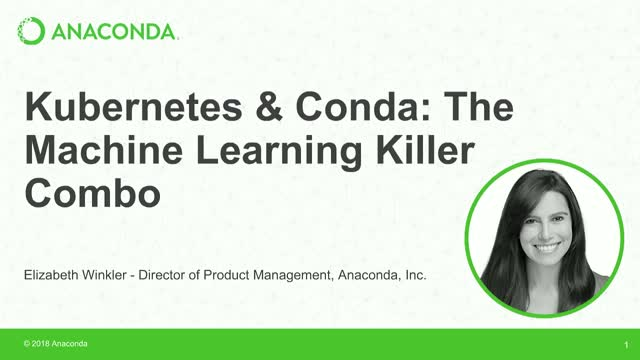 Learn why in this presentation from Anaconda Director of Product Management Elizabeth Winkler. Elizabeth Winkler has devoted her career to building SaaS products that leverage natural language processing and machine learning to extract meaning out of massive amounts of data. She is currently the Director of Product Management at Anaconda, the most popular Python data science platform. Previously, she built products at Atlassian, Salesforce, Spredfast, and a medley of startups. Elizabeth was born and raised in Mexico City and has lived in Paris, Milan, and San Francisco before calling Austin home. She is an avid world traveler and a polyglot fluent in English, French, and Spanish and quasi-fluent in Italian.